Poor Unfortunate Souls– a turquoise base with scattered holographic, silver holographic micro flakies and glitters, iridescent micro glitters, aqua to purple to pink crystal flakies, and pink to violet to red to copper multichrome pigments. Swatches show two coats with glossy topcoat. Formula had a medium feel and built super easily to opacity. The shimmer is so very strong, you’ll mostly see that fuschia glow but on tilt a lime green and gold will peek out. PBU has such a magical glitter/flakie mix. All of these have that certain flair that just SPARKLE so loudly, it’s gorgeous. I will say, depending on your topcoat you’ll need to go a little heavy handed to avoid the slight texture I was getting. This one and the next I noticed just a touch, but on the others I went a little heavier on my topcoat and they were fine. 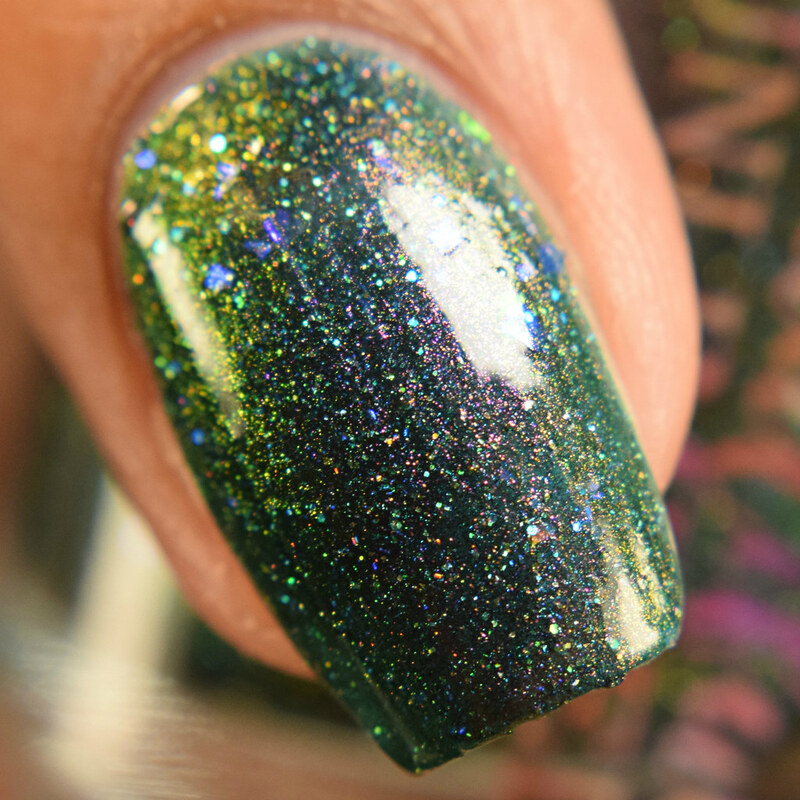 Long Live the King– a black base full of silver holographic micro glitters, scattered holographic, 3 types of crystal chameleon flakies and copper to gold to green multichrome pigment. Swatches show two coats with glossy topcoat. I’d like to state as a blanket statement that I’d recommend a glossy topcoat on all of these to really exploit the sparkles. They’re intense and just pop that way. Formula is similar to Poor Unfortunate Souls; it built super easy to opacity. Gorgeous rich coppery color, with an easy strong shift of green and gold on tilt. Good Form? Blast Good Form!– a deep reddish tinged base with silver holographic micro glitters and shreds, purple/blue/green crystal flakies and red to copper to green multichrome pigment. Mistress of all Evil– a royal purple base filled with silver holographic micro flakies, 2 types of crystal flakies and purple to green shifting magnetic pigment. Swatches show three coats, with the magnet applied on the third coat. Formula felt a touch lighter than the others but I had full opacity at three. The magnetic pigment in this is intended for a subtle appearance (the particles seem a bit larger than what I’m used to) and as you’ll see in the video it looks fantastic with or without the magnet applied. The base is a deep royal purple and the pigments in this are a bright aqua giving a lovely contrast and loads of sparkle. There is movement with the magnetic pigment, so if you choose to use the magnet, it adds more depth. A Snake Am I?– a wine base loaded with scattered holographic, silver holographic micro flakies and glitters, copper micro glitters, 2 types of crystal flakies and wine to red to copper to gold multichrome pigment. Swatches show two coats with glossy topcoat. Same as the previous polishes, medium feel and going in a touch heavy on topcoat eliminated any texture. I was very excited for this as Aladdin is one of my favorites and Jafar was VERY well done! Super flattering type of red on any skin tone, and you’ll see that scarlet shift to orange and gold on extreme angles. Is My Hair Out?– a purple leaning blue base with silver holographic micro flakies, scattered holographic, 2 types of crystal flakies and blue to purple to green multichrome pigment. Swatches show two coats with glossy topcoat. Same type of formula, feels on the medium side and built quickly. This was one of my favorites too. The blue is so pretty and bright, while the purple shift gives a glowing effect. Loads of sparkle to see here too! Did I Say No Purple Dragons?– a blackened purple base with spectraflair, scattered holographic, silver holographic micro flakies and glitters, 4 types or crystal flakies and blue to violet to purple multichrome pigment. Swatches show two coats with glossy topcoat. This one was interesting because the first coat looked like I would need to go to three coats, but nope! At the second coat I was good to go! This one has an almost squishy feel to the overall look but don’t be fooled as I would not classify this as a jelly; it’s too opaque/rich. You’ll mostly see that vampy purple with a strong red shift on tilt. Phony King of England– a mustard leaning base loaded with silver holographic micro flakies, scattered holographic, a mix of 5 chameleon shifting micro glitters, 2 types of crystal chameleon flakies and red/copper/gold multichrome pigment. Swatches show two coats with glossy topcoat. Similar formula as the others, and the multichrome pigment is very strong here too. You’ll mostly see an olive base with a very strong reddish-copper, and gold on tilt. Super pretty, and I’m digging the contrast in colors here. Mirror, Mirror– a yellow leaning green base packed with silver holographic micro flakies and scattered holographic, 3 types of crystal chameleon flakies, gold to green shifting micro glitters, iridescent micro glitters and red to gold to green multichrome pigment. Swatches show two coats with glossy topcoat. This is a warmed forest green to me, and the multichrome pigment is very strong and appears as a reddish copper with lime green and gold on tilt. The entire collection is available in the shop now, each at $11.50 individually, or $90 for the set. I can’t stress enough how sparkly/shifty these are. If complex shades are your thing, I highly recommend picking up a few of these to try out. Be sure to check out my swatch video too to see the sparkles in action! Also, if you haven’t already, I’ll link the Facebook fan group as well.